Did my ears hear correctly? The Prime Minister? The Princess? Did I somehow get passed the royal guards of a private palace in Bangkok? Not exactly... This was just another busy day for the staff members of The Siam in Bangkok, Thailand. 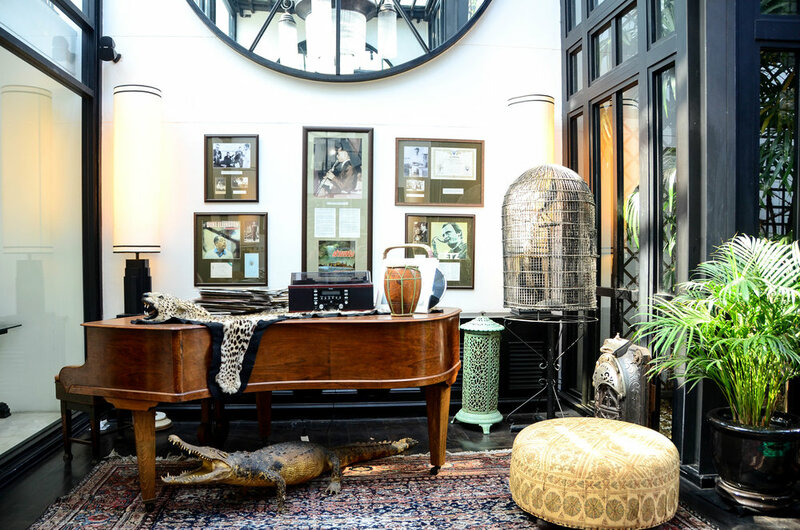 And the busy days haven’t seemed to slow down (nor does it seem like they will) at all since this magical boutique hotel opened its doors in 2012. For our first trip to Thailand, Jay and I knew we would need somewhere peaceful to rest our heads after 24 hours of traveling from New York City. We figured, "Why not splurge a little and go for the best to get our bodies acclimated?" 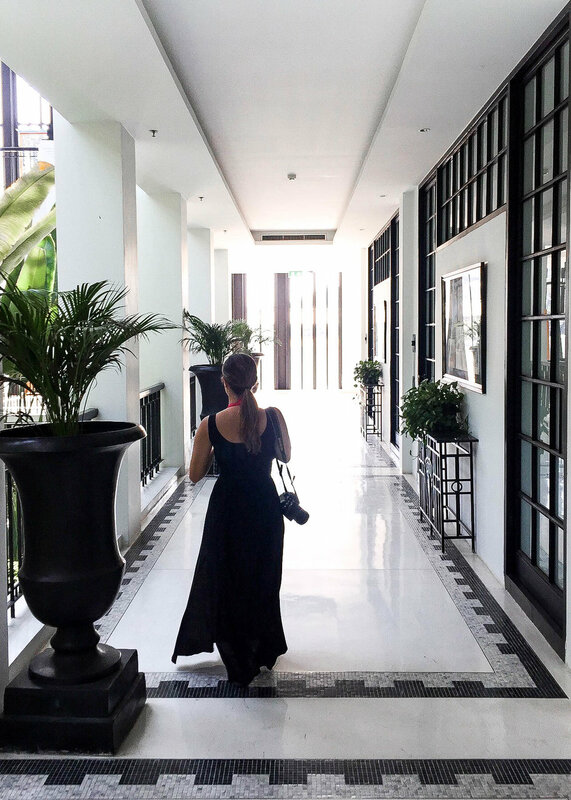 I had seen photos of The Siam here and there, but I wasn’t at all prepared for the enchanting luxury experience that was awaiting us on the other side of the world in Bangkok. 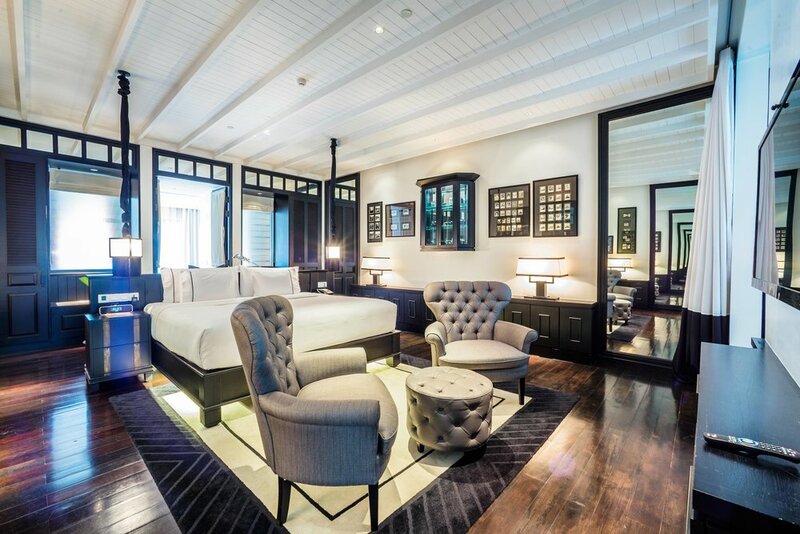 The Siam is an exclusive, stylish escape that is tucked away along the Chao Praya River in the historical Dusit district of Bangkok. If you’re lucky with Bangkok traffic, it’s a 45-minute drive from the Suvarnabhumi International Airport. If you need, the hotel is able to assist with private transportation—which I recommend doing ahead of time—to make sure you arrive safe and sound to your serene getaway. The warm and friendly evening staff greeted us as our car pulled into the driveway just before midnight. “Sawasdee Krab, Ms. Dominguez and Mr. Schoen! 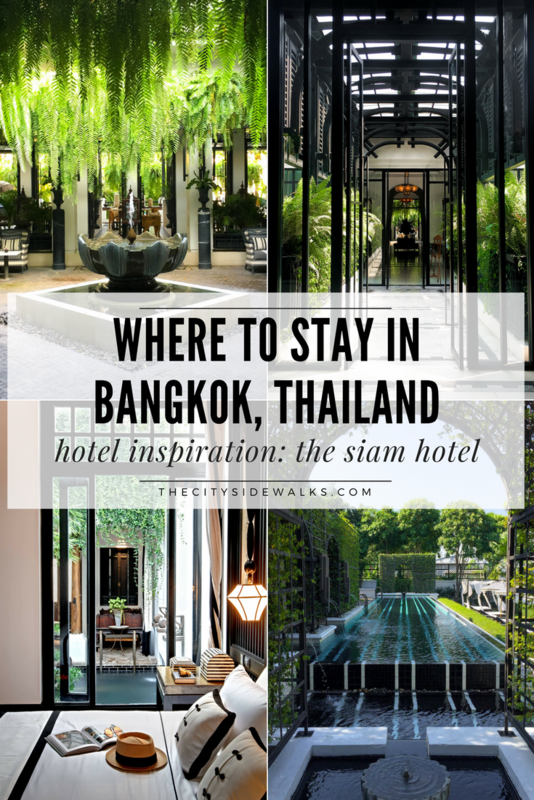 We hope you enjoy your time with us at The Siam.” Even through the groggy haze of our intercontinental travel, we knew this was about to be a memorable place. In all honesty, it’s almost impossible to find just one word that encompasses all that The Siam is. 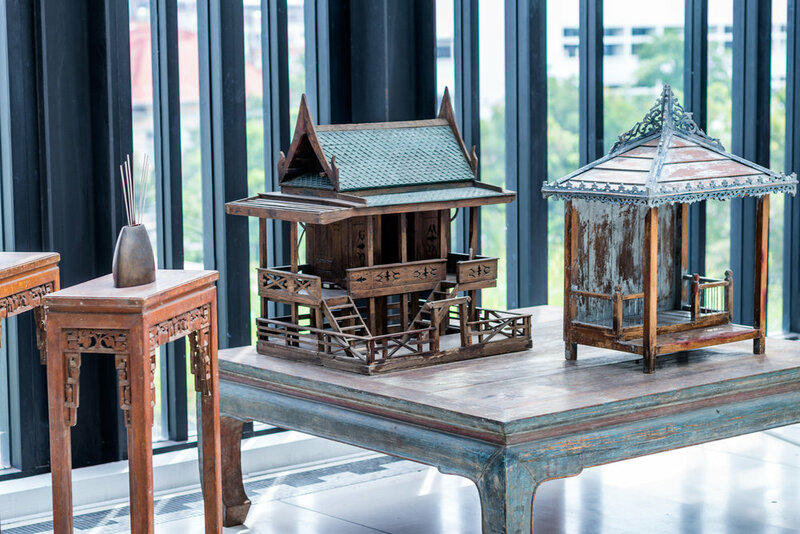 Maybe a phrase will do: The Siam is a remarkably intriguing, one-of-a-kind work of art. This creative oasis is no stranger to the occasional celebrity guest, dignitary, or royal family member. And they treat every single one of their guests like VIP. 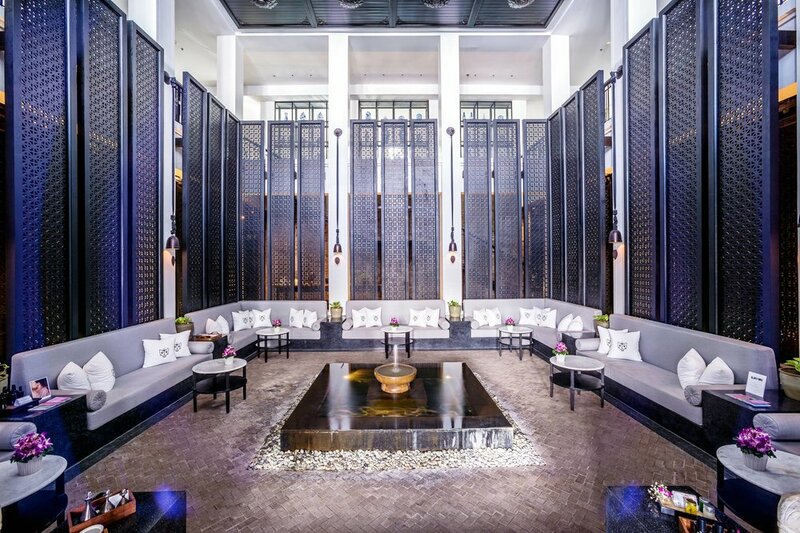 Once you step inside The Siam, you definitely get a sense that this resort was built for the uber-chic and sophisticated world traveler. When the hotel lobby has the ability to take your breath away, you know you’re in for a real treat to explore the rest of the property! As we walked through the bright and spacious atrium, we were greeted by an elegant, calming collection of plants that stood so high they seemed as if they could graze the glass ceiling right above them. The pop of green color in the plants really stood out in contrast to the stark white, black, and neutral colors that surrounded them. We quickly noticed this interesting color pattern was a common feature of the interior decor throughout the hotel. To say that the design and decor of The Siam is spectacular is really selling it short. Krissada Sukosol Clapp, Bill Bensley, and Khemvadee Paopanlerd, the creative brains behind this property, really outdid themselves when crafting the unique guest experience of the hotel. 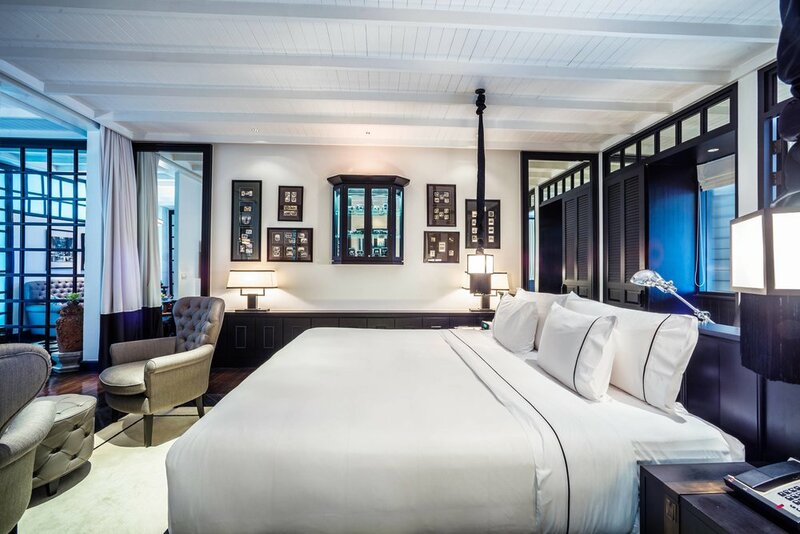 Each of the 39 rooms of The Siam (which include expansive suites, secluded pool villas, and a private cottage) is open and airy with just enough style and grandeur that it will make you reconsider your entire decor selection at home. 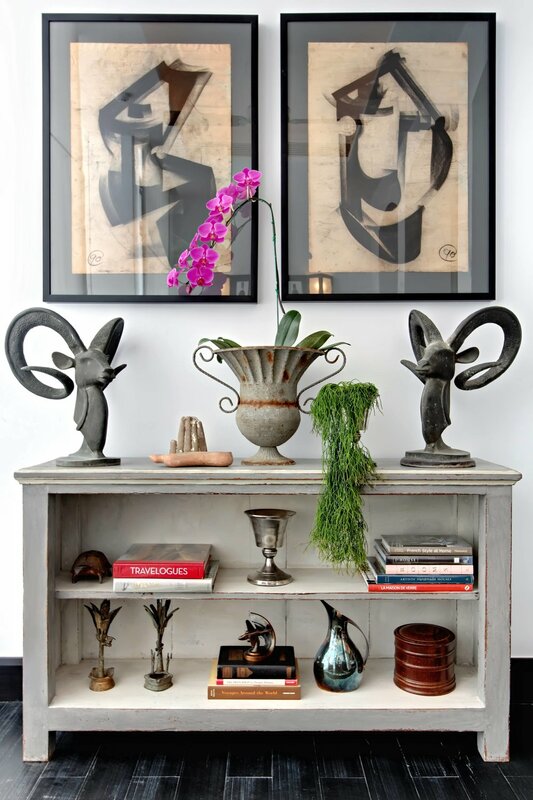 There are touches of modern elegance and Art Deco design juxtaposed with eye-catching colors and rare antiques. The overall ambiance is meant to reflect the period of time when Bangkok was under the rule of King Rama V, around 1853-1910. 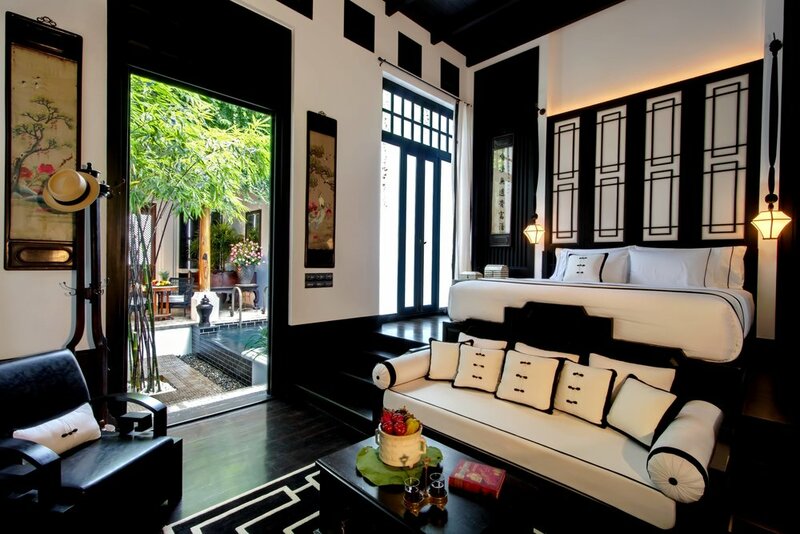 For our stay, we opted for The Siam Suite, which didn’t spare any luxury. Our two favorite aspects of this suite were the large soaking tub in the bathroom and the colorful sitting room we had towards the front of the suite. The massive king size bed—which would probably take up all the space inside our New York City bedroom—was sooo comfortable, which made acclimating to the 12-hour time difference pretty easy. As a matter of fact, give me that bed whenever I travel and I’ll never have any issues with adjusting to time zones again! In addition to this gorgeous suite, we also had free WiFi throughout the property and our own personal Butler, who was SO helpful! The Butler staff here really goes above and beyond to make sure you’re all taken care of throughout your stay. We were also able to enjoy complimentary boat service along the river between the hotel and the Saphan Taksin pier, as well as complimentary breakfast each morning in the restaurant. Breakfast came with a ton of different selections and was very tasty. I loved the unique juice combinations that you could order! I never thought it was possible for a building or hotel to have “personality,” but damn does this hotel have personality, character, and soul! I’m not kidding when I say that you can walk into every room and instantly feel like it has a story to tell. It’s incredible that a place that was only opened in 2012 can give off that kind of vibe! A lot of this vibe is thanks to the marvelous antique collection housed around the hotel, which makes it so distinct and Instagram worthy. Every corner you turn, there is something different and captivating that you could stare at for hours. 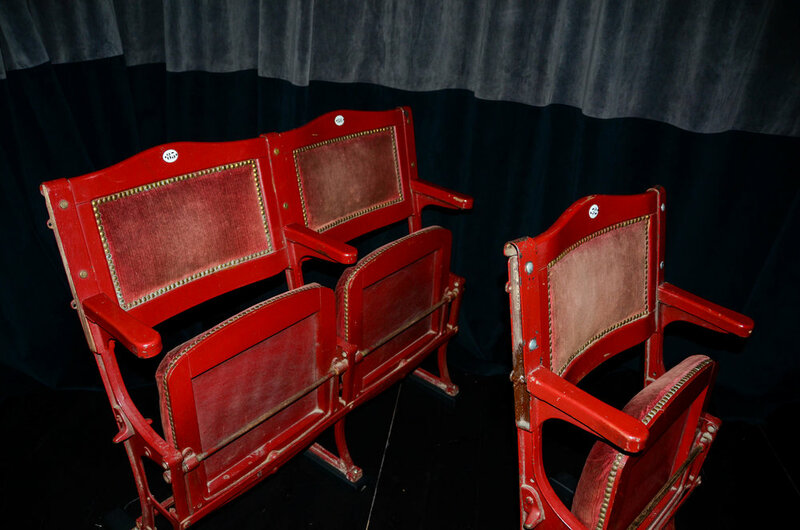 The history and stories behind each artifact and collectible makes you curious about where they came from and what they mean. 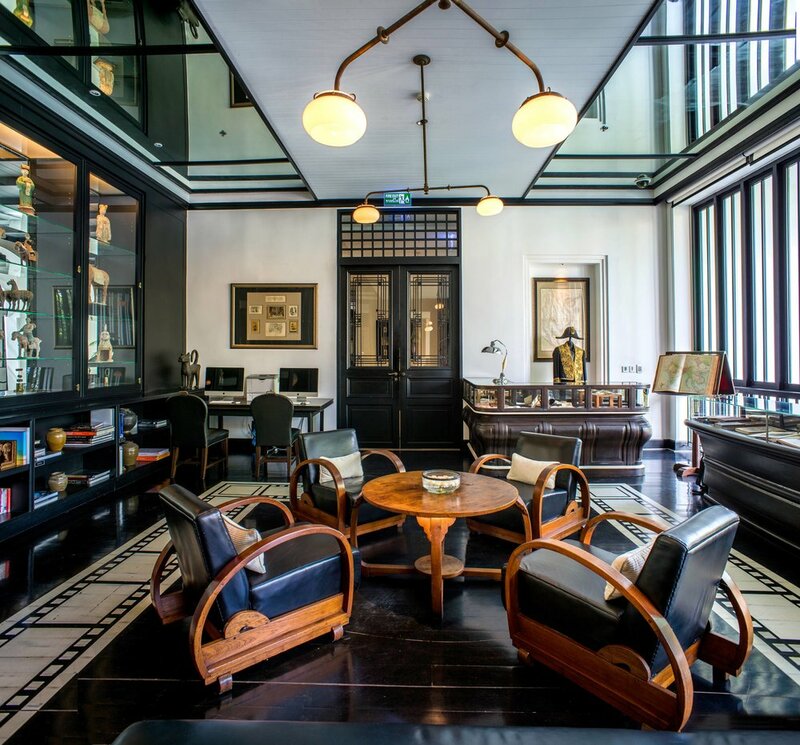 We were actually shocked to find out that Krissada Sukosol Clapp, whose brainchild was The Siam, was the main owner and collector of the art and antiques throughout the hotel. When he was developing the idea of The Siam, it was actually intended as a place to house all of his unique treasures from around the world. 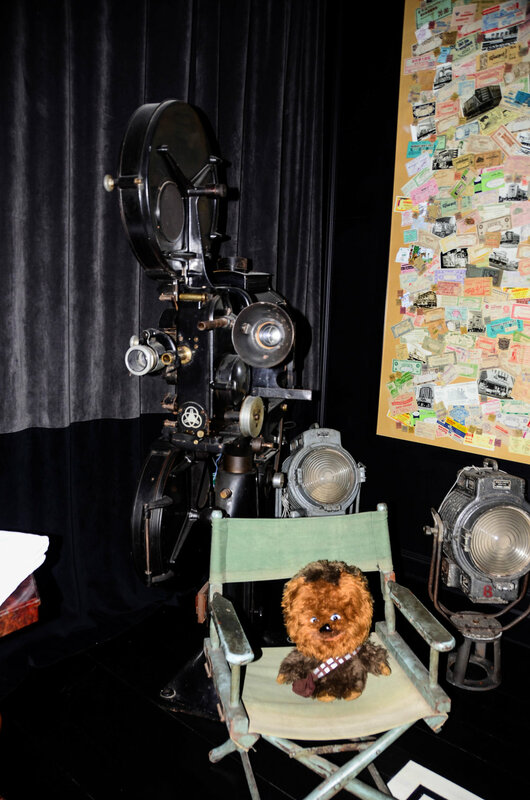 I’m so thankful that he decided to incorporate an experience like this into the hotel because each little detail makes The Siam feel like you’re actually living in a museum. It’s so incredible! 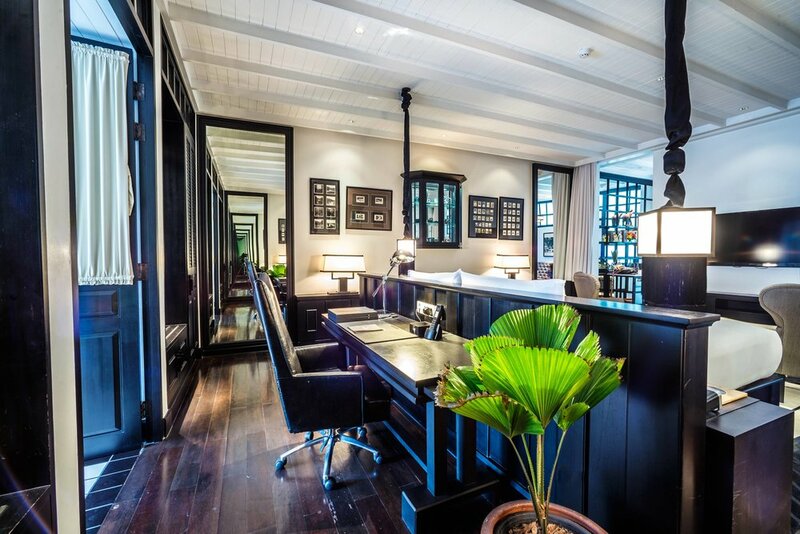 A stroll through the hotel’s library will give you a tiny hint of the attention to detail paid here at The Siam. Kriss is so meticulous about each and every little aspect of the collection, which really makes the experience so much richer. We were told that he still comes in throughout the month to add new pieces and treasures as he sees fit. I personally love when an owner is this involved in the experience because it helps you feel that soul, personality, and character behind the project. It’s the secret sauce that makes a hotel stand out like this one does. The first thing we did after catching up on sleep from our insane jet lag was explore every inch of this hotel. We actually ended up spending most of our first day just admiring all of the artwork! Take a look through the library, the movie room, the restaurants, the spa, and more. Seriously, every nook and cranny is worth taking a look at. Every guest should take advantage of the complimentary river cruise, but it’s particularly special at sunset. You can even take cocktails on board with you to enjoy while you’re taking in the sights on the River of Kings. Schedules are available at the hotel and online. I never would've thought that getting a tattoo would be on my list of things to do at a hotel, but The Siam proved me wrong! The sacred tradition of Sak Yant dates back over two millennia. Tribes around the Asian continent would use the intricate patterns of the tattoos to impart magical powers for protection, luck, fortune, charisma, and other powers to the wearer. If you want to make your trip to Thailand truly memorable, you can make arrangements at The Siam’s private Sak Yant Tattoo Studio, where you’ll be inked by the talented artist, Ajarn Boo. In each guest room, you’ll find a special smartphone that will allow you to access information all around Bangkok without having to worry about your international connection or provider. This smartphone is already pre-programmed with tons of valuable travel tips for Bangkok, sample itineraries, and even immediate access to your Butler. It's the perfect pocket guide to take along when you’re out and about! We used ours to discover some nearby attractions and to learn some of the etiquette customs of Thailand. Muay Thai Boxing is a popular traditional Thai sport that helps with overall fitness and wellbeing. The Siam has their own state-of-the-art Muay Thai trainers and boxing ring for you to practice your moves during your stay. 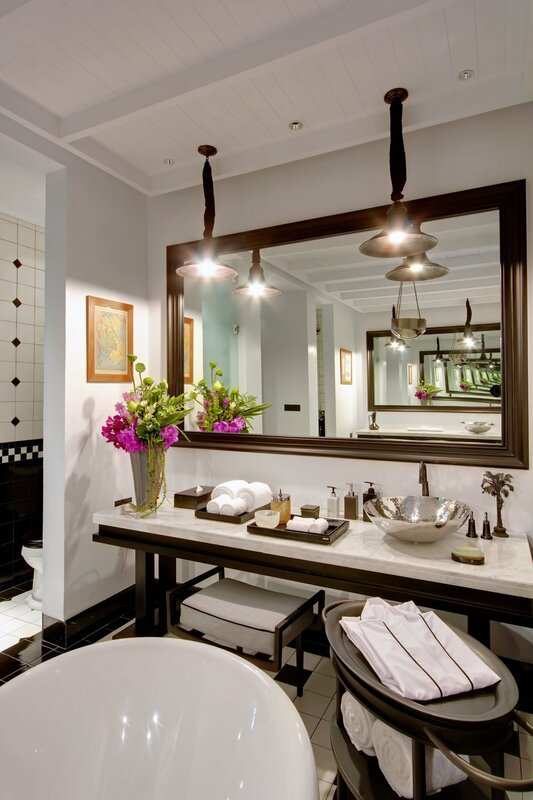 Similar to other popular Thai hotels, The Siam offers guests a wide variety of drinking and dining options on site. 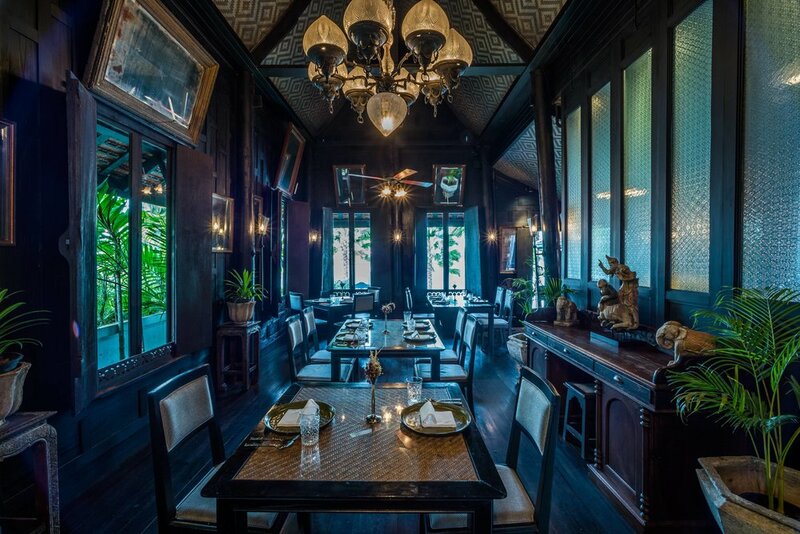 Enjoy some authentic Thai cuisine in the Chon Thai Restaurant, which is set amongst three, century-old Thai Teakwood houses. 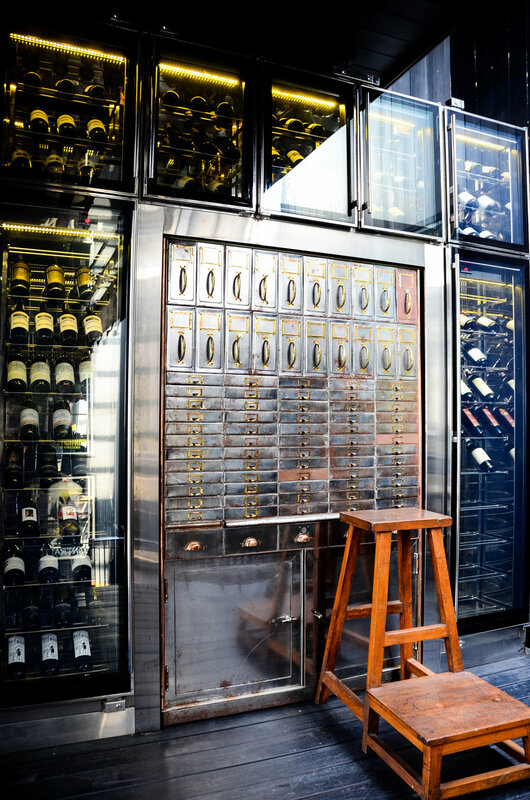 Step back into the Jazz Age at the Deco Bar & Bistro for some international cuisines (and to catch a look at the incredible instrument collection). 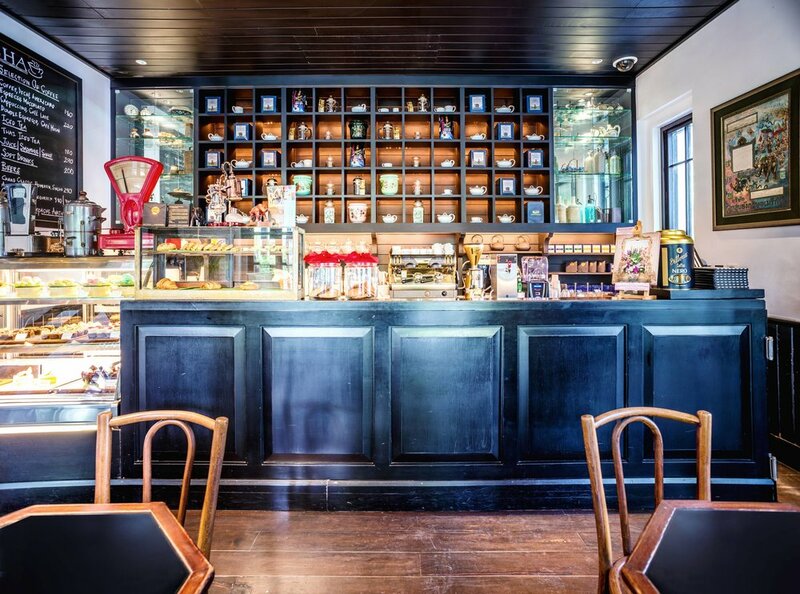 Last, sit down with a coffee and pastry at Café Cha, or sip a cocktail poolside at the Bathers Bar. 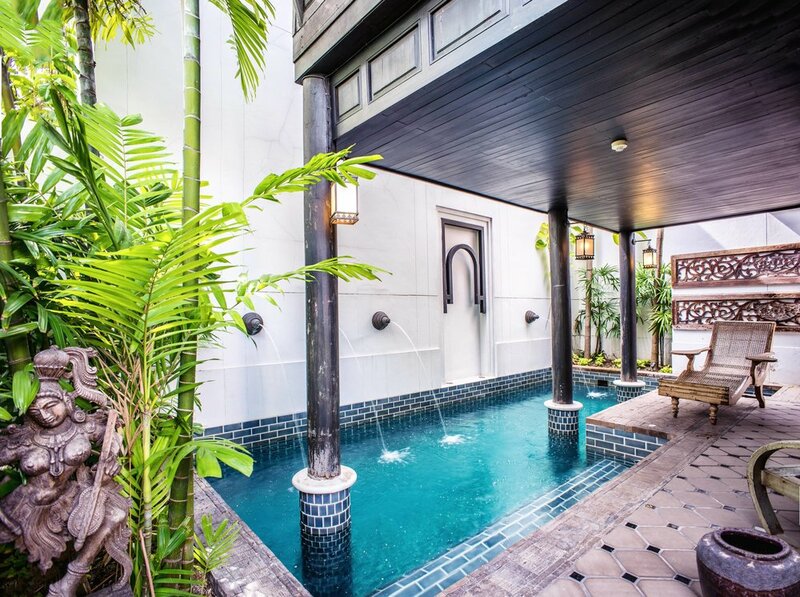 You haven’t really been to Thailand if you haven’t indulged in at least one spa treatment. 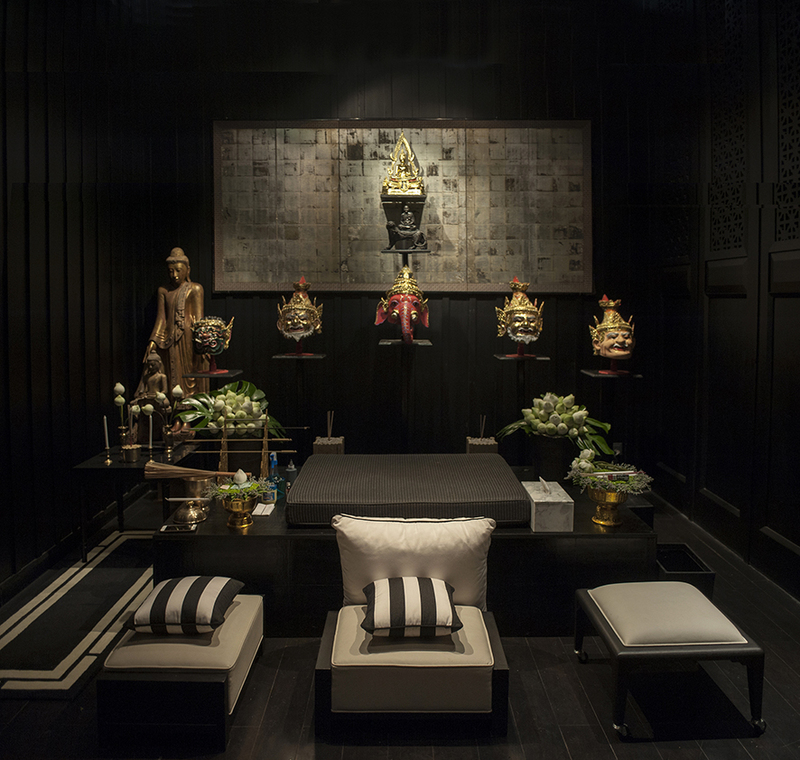 Step into The Siam's world-renowned Opium Spa and enjoy a full day of pampering. 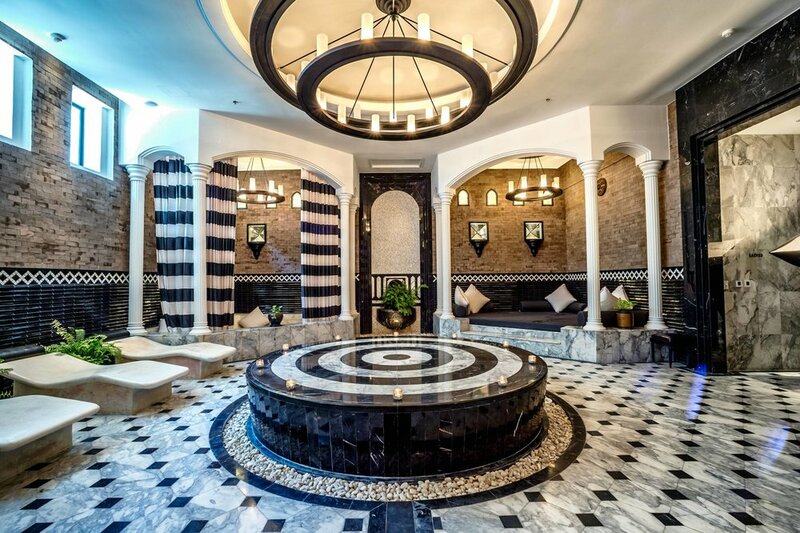 Sadly, we didn’t have time for a treatment during our stay, but we did have a look around the spa—which, at the very least, I highly recommend doing! 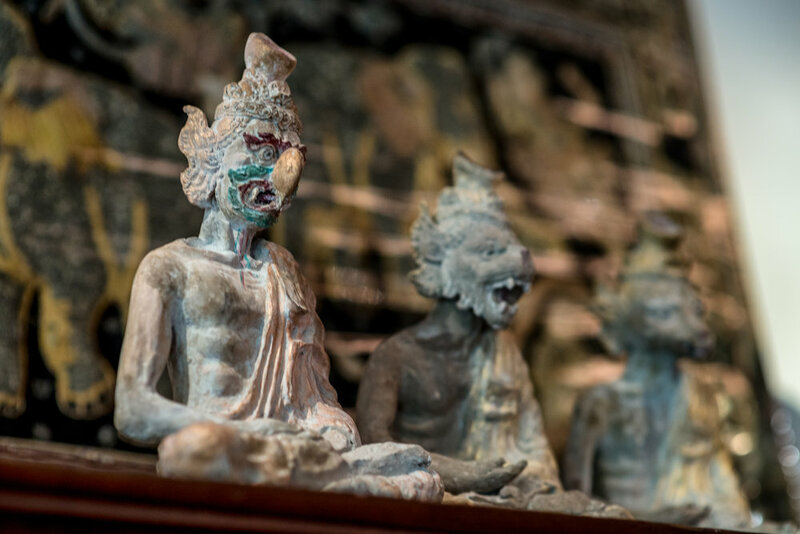 The Siam has taken the time to put together a curated selection of cultural experiences for all guests to enjoy during their stay. You can sign up for a hands-on cooking class, have a unique dining experience with The Siam Easy Weekend, or relax on a Private Dinner Cruise upon a fully refurbished teak rice barge. Make sure to book these things in advance, or check with your Butler upon arrival to see if they are available! Relax by the Riverside Infinity Pool. Explore the nearby Dusit district. Check out local markets, the Grand Palace, the Dusit Zoo, temples, Vimanmek Teak Mansion, and other attractions. Use the free river cruise to access the BTS Skytrain and MRT Subway to get around quickly in Bangkok. Indulge in Happy Hour to get buy-one-get-one-free drinks. 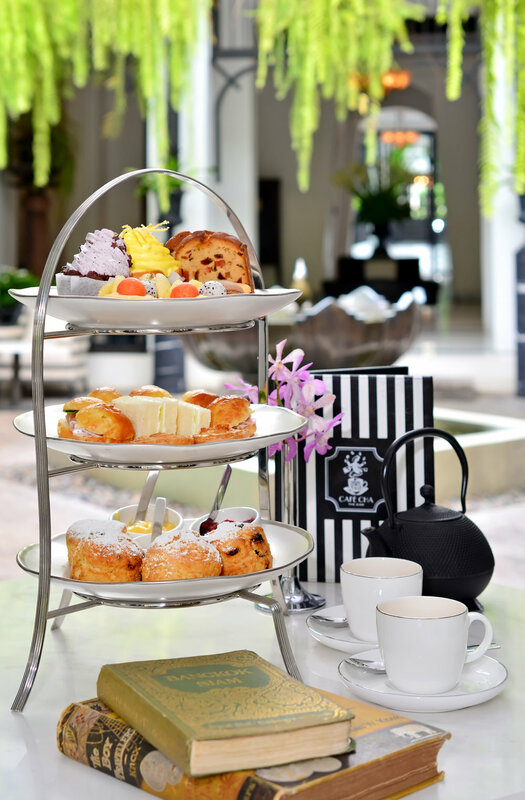 Have Afternoon Tea at Café Cha or in the English Garden. 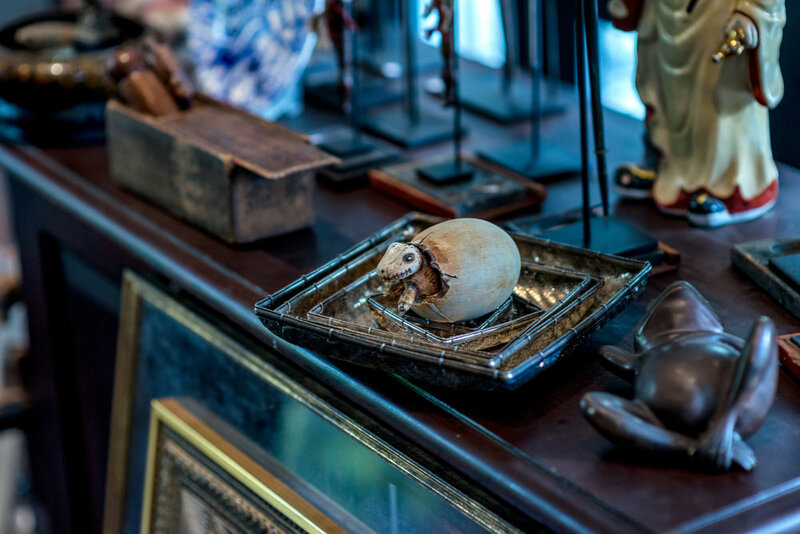 Take some treasures home with you by shopping in The Siam’s unique antique gift shop. Rejuvenate your mind, body, and soul with their 4-Day, 3-Night Wellness Program, in partnership with Dr. Adrish Brahmadatta, a notable Ayurvedic doctor and yogi. Workout with your own personal trainer at the gym. In good traffic, the airport is about 45 minutes away. I would suggest arranging a car service before you arrive in Bangkok to take care of this. The Siam can assist with this if you need. 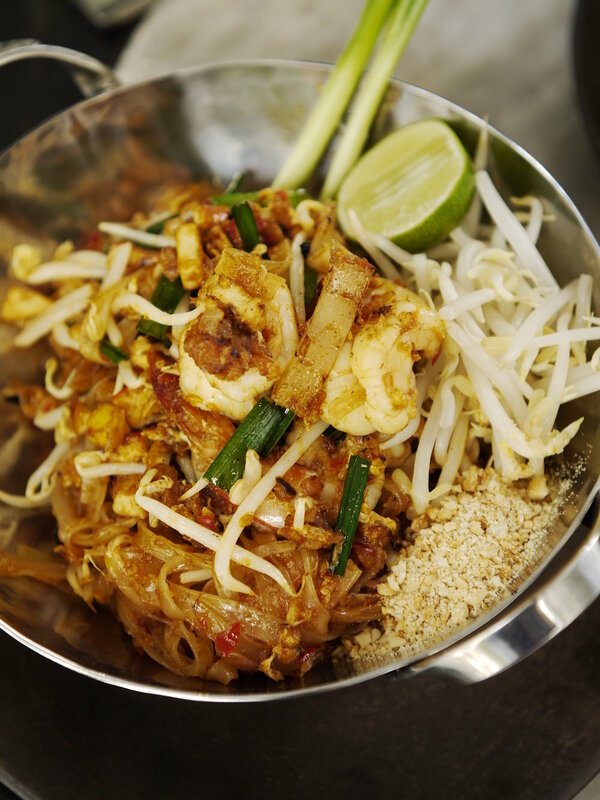 The downtown Siam Square is just 20 minutes away. You can get there by car, subway, or boat. Take advantage of the free river cruise, which will take you to the nearby subway and skytrain stops. The nearest BTS station is the Saphan Taksin stop. The nearest MRT station is the Hua Lampong stop. If you need to get around the city, Uber is very popular and inexpensive, and a little more reliable than a tuk-tuk. But, the tuk-tuk gives you an authentic experience...so you choose. You can use my Uber code right here to get a discount on your first ride. There is an ATM in the hotel if you need to get any Thai Baht during your stay. The hotel is pet friendly, which means you can bring your fur babies along for an additional fee per night. Looking back, there couldn’t have been any better way to kick off our adventures in Thailand than staying at The Siam. We truly felt like royalty after leaving. This hidden gem in the heart of Bangkok set the bar so high for everything we experienced from there on out. 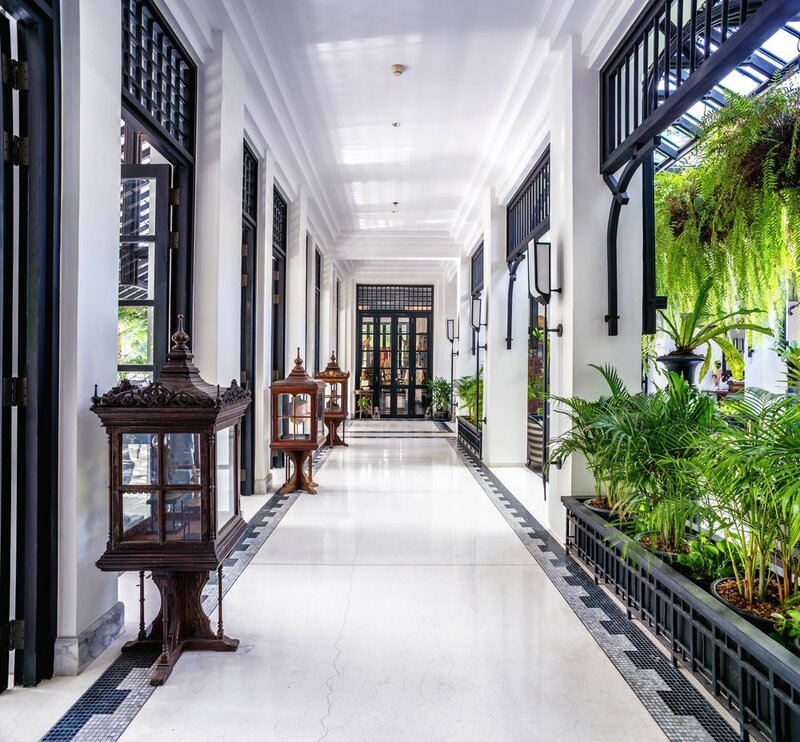 The original architecture, art, hospitality, and overall ambiance of The Siam gave us a first-class, cultural experience that we will never forget. It left us wondering one thing: Is it really fair to have this much beauty under one roof?! Thank you to The Siam Hotel in Bangkok for hosting our stay. And a special thank you to all of the incredible staff members who made our visit spectacular. This post may include affiliate links, which comes at absolutely no cost to you. All proceeds go directly back into maintaining this website and making it better for you. All opinions are my own.